Welcome to Aluminum Supply Inc. Thank you for visiting our web site. 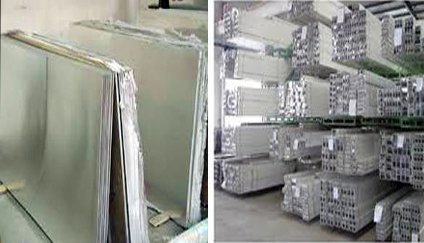 MyAluminumSupply.com is a wholly owned subsidiary of Aluminum Supply, Inc. We incorporated in Orlando, Florida in 1955. We have the largest variety of aluminum extrusions, sheet and plate in central Florida. For 60 years we have been an aluminum supplier cutting to size any aluminum or steel product with no minimum order required. We have opened our warehouse to the internet providing the same services to anyone needing Aluminum cut to size, DOM Steel Tubing or 4130 Chromoly tubing cut to size. We show pricing for all of the materials we have in stock and you may order what you need and pay for the materials and UPS or FedEx Small Packages or FedEx Freight shipping charges using an American Express, Discover, Master Card or Visa Credit Card. Once the order is placed you will receive an email conformation or if you prefer we can call to confirm your order. 1 (877) 849-6595 to discuss your requirements and the size and type of Aluminum, 4130 Chromoly or DOM steel tubing you require. We can give you pricing and take your credit card information over the phone. For the materials that we do not have on hand we can usually fill your order in a days time and have the material cut to your specifications and shipped UPS the very next day. We will attempt to provide you with whatever you need cut to your specifications and ship it to you FedEx or UPS within 48 hours of receipt of your order. If you require fabrication or special orders for multiple parts we can also provide you with quotes for these services and materials as well. We only offer Aluminum products, DOM steel tubing and 4130 Chromoly tubing to our web site customers at this time. We will try to help you fill any requests or needs, if you don"t see what you need on our web site, please call us and we will do our best to provide you with what you need.